Jingles Snow Swirl Santa Lantern with battery operation is suitable for indoor use as a delightful illuminated Christmas water globe. 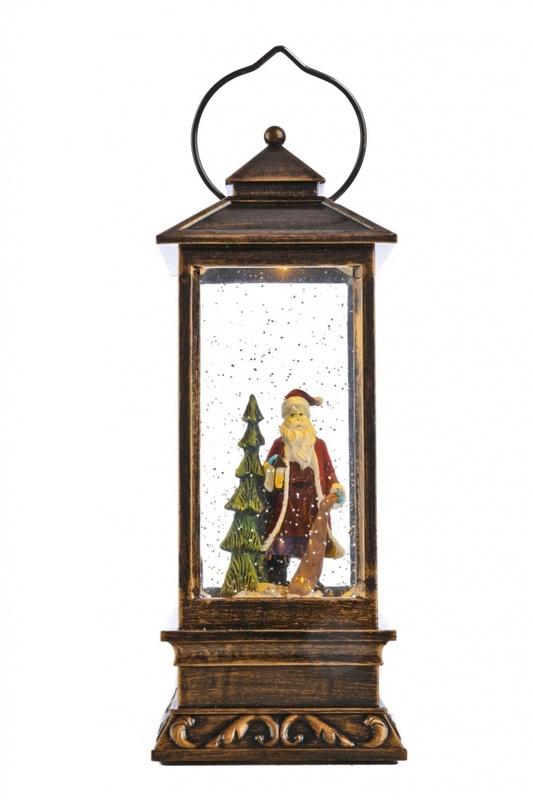 Plastic and resin construction with oil brushed bronze effect finish, depicting an old oil lantern with internal spinning water glittered snow. Creates a calming and seasonal feature for fireside, tabletop or mantlepiece, or as a child's Christmas nightlight, watchable as the glittered snow swirls around the Santa inside the lantern. Lights up and Swirls snow requiring 3 x AA batteries (not included).